In an effort to combat the problem of saliva overflow (i.e., sialorrhea or drooling), Innovative Human Services, Inc., in collaboration with Children's Medical Center at the University of Virginia, and Texas Scottish Rite Hospital for Children in Dallas, are developing, testing and getting ready for manufacture the Chin Dry System (trademarked: only reference to trademark in this document) and the Swallow Frequency Device. The Chin Dry System technology helps people with the problem of saliva overflow to stay clean from unwanted saliva. The Swallow Frequency Device technology, which measures sound signals produced by swallowing by "listening", allows clinicians to know the quality and frequency of a person's swallow. The Swallow Frequency Device functions as a stand alone research unit, or works as a companion module to the Chin Dry System. The following discussion describes the research and development and current status of these two products. Problem Presentation. Drooling, (i.e., sialorrhea or saliva overflow) is the unintentional loss of saliva and other contents from the mouth (Blasco, #1 ref.) The topic of drooling typically generates unease, strained silences, embarrassment, or possibly jokes and amusing discussions. Drooling interferes with: 1) placement in the workforce for job-ready adults, 2) achievement of literacy skills for the school-aged population of children, 3) social relationships both intimate and merely familiar, 4) caregiver's burden of changing and cleaning clothing, and 5) technology interfaces (i.e. keyboard use). Poor saliva control occurs because of difficulty in the oral or voluntary phase of swallowing. (Lipkin, #2 ref.) It is both a clinical sign and symptom that is often a consequence of medical and/or neurological disorders. (Cerebral Palsy, #3 ref.) Additionally, clinicians who attempt interventions with droolin cannot successfully a) measure the amount of saliva produced by a person (measurement allows clinicians to determine the severity of the problem and to match the severity to a state of the art intervention); b) give the person who drools some effective control over the drooling problem; and, c) provide a hygienic means for removing drool and thereby eliminating odor. Small numbers of determined professionals, and people with drooling problems, have begun to address these problems in an aggressive manner. They realize the need for some method by which people who drool can overcome this socially unacceptable problem. In 1990, twenty eight professionals and individuals who drool from diverse medical, clinical, engineering, and technology backgrounds and disciplines attended a Consortium on Drooling at the Kluge's Children's Rehabilitation Center, the University of Virginia Health Sciences Center. The mp. 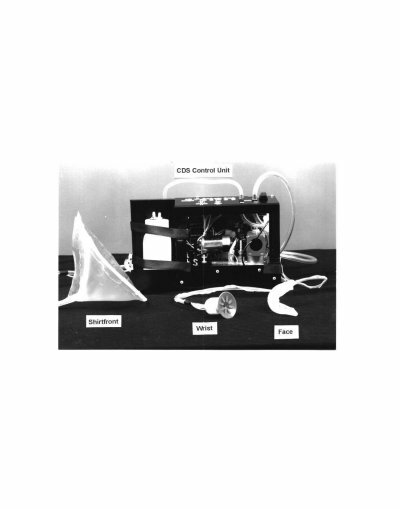 Researchers also designed the CDS prototype as a research tool for professionals to determine the effectiveness of different behavioral, pharmacological, and surgical techniques and interventions to impact problem drooling. It is also a training tool for teaching people how to use the technology and how to swallow more effectively. For training, the CDS has recordable speech, speech output, environmental control, battery-controlled devices, and head tilt monitoring. Swallow Frequency Device. The Swallow Frequency Device uses swallow sounds (cervical auscultations) to count pharyngeal swallows in humans. The SFD consists of a "stethophone", software, and a microprocessor. Researchers have developed a "stethophone" prototype, a combination of a stethoscope and microphone into a single unit that is placed correctly on the throat to "listen" to a swallow. 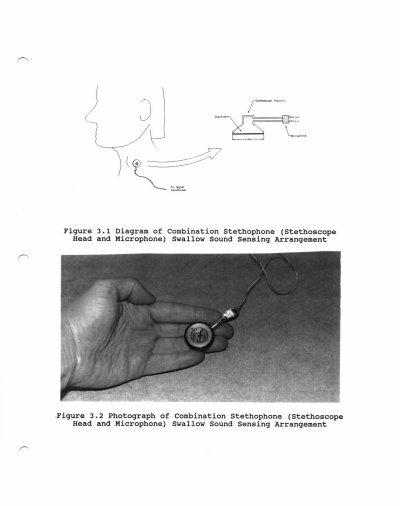 The stethophone device obtains a non-invasive external sound sensor, which transmits swallow sounds but rejects other sounds such as speech and coughing as well head or muscle movements. The unit utilizes pattern recognition hardware and software, such as used in speech recognition. The Chin Dry System. To date, researchers have had eight rounds of testing and input from research subjects who are potential users. With each round of testing, researchers and engineers modify and redesign the system and again get feedback from research subjects/users. Some of the collection units have had up to 25 iterations of design changes based on input from research subjects. The research is a very evolutionary process. Data from any and all functions of the CDS can be logged and stored for later analysis. It has been determined that the Chin Dry System is effective, aesthetically appropriate, acceptable to users, hygienic, usable by ambulatory and non-ambulatory people, affordable, and acceptable to caregivers. Swallow Frequency Device. The SFD is designed to be an optional module that can be interfaced to the CDS. It tracks when the research subject does or does not swallow. Based on the research subjects actions, the CDS will cue the subject to swallow or to activate the CDS for vacuuming. The SFD, developed by the UVA research team, is in its fourth generation of development and testing. Researchers are into finalizing the prototype research and development of the CDS technology and its companion technology, the (SFD). Long term field testing of the CDS begins in January 1999. Research is underway with the SFD to determine its accuracy in recognizing the swallow sounds of the research subjects as they perform different swallowing functions. Included in the selected research subjects are individuals with disabilities. In this presentation, Ms. Allaire will share with the audience research results of 10 months of testing with the SFD. Researchers are developing these systems to manufacturing production level readiness based on testing with research subjects and consultants and plan to have a manufacturing agreement for production and sale of the CDS by projects end. 1. Blasco, P. A. and Allaire, J. H. (1992). Drooling in the developmentally disabled: Management practices and recommendations. Developmental Medicine and Child Neurology, 34, p. 849-862. 2. Lipkin, P.H. (1991). Epidemiology of the developmental disabilities. In Capute, A.J., Addardo, P.J., (Eds.). Developmental Disabilities in Infancy and Childhood. Baltimore: Paul H. Brooks Co. 43-86. 3. Cerebral Palsy Fact Sheet. Cerebral Palsy Association of Western Australia, Ltd.
4. Blasco, P.A., Allaire, J.H., Hollahan, P.M., Blasco, P.M., Edgerton, M., Bosma, J., Nowak, S., Sternfeld, L., McPherson, K., & Kenny, D. (1991). Consensus Statement of the Consortium on Drooling. United Cerebral Palsy. Acknowledgement: Innovative Human Services, Inc. would like to thank the Dept. of Health and Human Services, National Institutes of Health, National Institute of Child Health and Human Development for funding this reseach. This grant is authorized under grant number 5R44HD33300-03, Technology for Swallowing Dysfunction and Sialorrhea. Carrie Brown, PhD., Principal Investigator.